San Fernando is a district made up by the following areas: Victoria, San Fernando, and Virreyes. 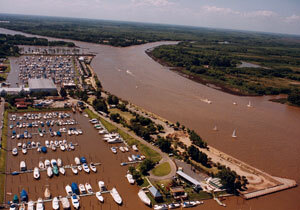 San Fernando is located in Northern Greater Buenos Aires, 28 away from the City of Buenos Aires. The area of San Fernando is constantly growing, not only demographically but also urbanely and is therefore chosen my many doing "weekend tourism." The region offers beautiful sites year round, and also allows for water sports, fishing, and hunting. San Fernando houses a great amount of boats of all classes, and was because of this declared the "Nautical Capital of the Nation" on October 27 of 1972. The area is full of clubs, commerce and industry all connected to the nautical branch. The School of Technical Education N°1, located in the district, educates specialist in Naval Engineering. In San Fernando you can find about 40 % of all of the industrial production related to naval activities in the country of Argentina. The district has a large number of shipyards. San Fernando has an International Airport in its limits and also maintains an efficient service of air taxis. More over from the harbor of Tigre there are regular services of motor boats to the islands of San Fernando. On the islands outside the coats of the San Fernando district there is logging and minery taking place. Escobar, Acassuso, Altimpergher, Beccar, Bella Vista, Benavidez, Boulogne, Campo de Mayo, Carapachay, Carupa, Del Viso, Delta, Escobar, Florida, Garin, General Lemos, General Pacheco, General San Martin, General Sarmiento, Grand Bourg, Ingeniero Maschwitz, Islas, Jose C. Paz, Jose Leon Suarez, La Lucila, Lopez Camelo, Los Polvorines, Malaver, Malvinas Argentinas, Manzanares, Martinez, Muniz, Munro, Marina Nueva, Olivos, Pablo Nogues, Pilar, San Fernando, San Isidro, San Miguel, Talar de Pacheco, Tigre, Tortuguitas, Vicente Lopez, Victoria, Villa Adelina, Villa Ballester, Virreyes, Vucetich.